A hologram of the murdered rapper Tupac Shakur appeared to perform alongside Snoop Dogg at Coachella on Sunday. More than 15 years after his death, rapper Tupac Shakur hauntingly returned to southern California on Sunday night to perform through a hologram. During the Coachella Valley Music and Arts Festival in Indio, Calif., Snoop Dogg and Dr. Dre "resurrected" the Los Angeles native, who was murdered in 1996. The rarity of such realistic hologram musicians, as well as the concept of bringing Shakur back to life, generated mixed reviews from disturbed music critics. Under the direction of Dr. Dre, who envisioned bringing Shakur back to life, the hologram appeared to wear Shakur’s infamous “Thug Life” tattoos, jewelry and Timberland boots. 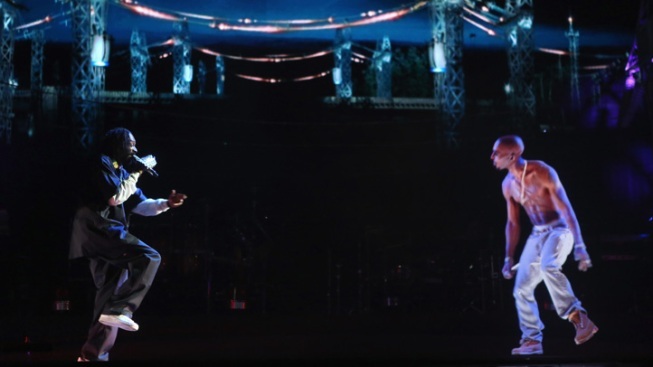 “What the [expletive] is up, Coachella?” the Shakur hologram said when it appeared on stage. Shakur's likeness performed “Come With Me,” “Gangsta Party,” and “Hail Mary” alongside the living rappers.